To begin with, we thought it was going to be a bit of a flop due to the acting (a tad on the cheesy side), but as the movie went on, it got better and better. At the end, it literally had me in tears, and I am so glad that we stuck through the sloooooow moments at the start. It’s raw, and it’s honest, and since I think that forgiveness and grace is something we all struggle with at times, I wanted to give away a copy to one of my lovely readers! To be entered, simply answer the question you find below, and put it in the comments box. Easy, peasy! First, the movie description to give you a little better idea of what the movie is about. After police officer Mac McDonald loses his son in an accident, years of bitterness and pain erodes his love for his family and leaves him angry with God … and everyone else. Can Mac and his new patrol partner, Sgt. Sam Wright, somehow join forces to help one another when it’s impossible to look past their differences—especially the most obvious one? Every day, we have the opportunity to rebuild relationships and heal wounds by extending and receiving God’s grace. Offer The Grace Card … and never underestimate the power of God’s love. 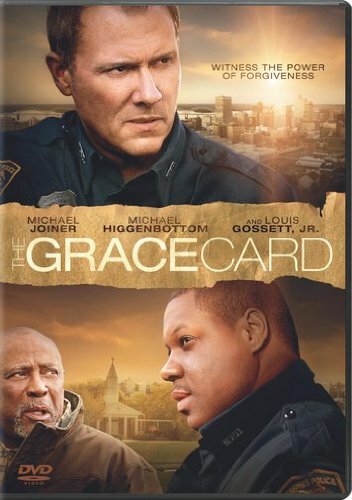 The Grace Card stars Michael Joiner, Michael Higgenbottom and Academy Award Winner, Louis Gossett Jr.
And here is the movie trailer. Take a peek, and if it looks like something you would be interested in, make sure to enter by answering the question below! The winner will be chosen on Sunday, March 29 using a random number generator. Now tell me, which movie have you watched lately that truly tugged at your heartstrings? Previous Post Do You Believe? I just watched ‘Ring the Bell’ last night on Netflix. I cried a few times for lost souls and being reminded of how much God really does love us. I am so unworthy, but also extremely grateful for His unconditional love. Thanks for the review, Susan! I actually have that in my to-be-watched queue on Netflix. I recently watched the movie “the blind side”. It had me in tears. I can’t imagine being him. The Blind Side is a great movie! I watched the story of Ruth, not too long ago. The love between Ruth and Naomi, the obedience and patience Ruth showed for her mother-in-law was amazing. Many people forget that Ruth was King David’s grandmother. Though not spiritual, American Sniper got to me….being a veteran, knowing the brotherhood that is created in war and then watching as a person who survived the war and was trying to help others lose his life to an imposter tore me up and then seeing the images of the motorcade at the end (it passed through my town) made me tear up as it is now just thinking about it. I will say I watched my wife watches a lot of movies on UPN, Hallmark Channel and one other I can’t think of and I usually tear up at least once or twice during some of those movies…lol…sorry can’t think of any in particular. Hey Rick! Derek and I haven’t seen American Sniper yet, but it is at the top of our list. We can’t wait to see it! I love the Hallmark movies too. Although not recent, I think the most moving movie I have ever watched is Passion of the Christ. I cried most of the way through it. I purchased a copy of it before it was released and watched it every year at this time until my ex loaned it out and I never got it back. I hope to get another copy someday so that my granddaughter can watch it with me and learn the true meaning of Easter. I still cried every time I watched it. Thank you for sharing, Glenda! I have to be honest and say that I’ve never seen it. Just thinking about the crucifixion gets me worked up, and I didn’t know if I could stand to actually watch it. I know, I’m a wimp!